Recently I got an invitation for the opening of an exhibition at “La Maison d’Aneli” presenting five different artists: Calypos Applewhyte, Moewe Winkler, Lagu Indigo, Stardove Spirt and MathieuL Bravin. La Maison d’Aneli is owned and run by Aneli abeyante. 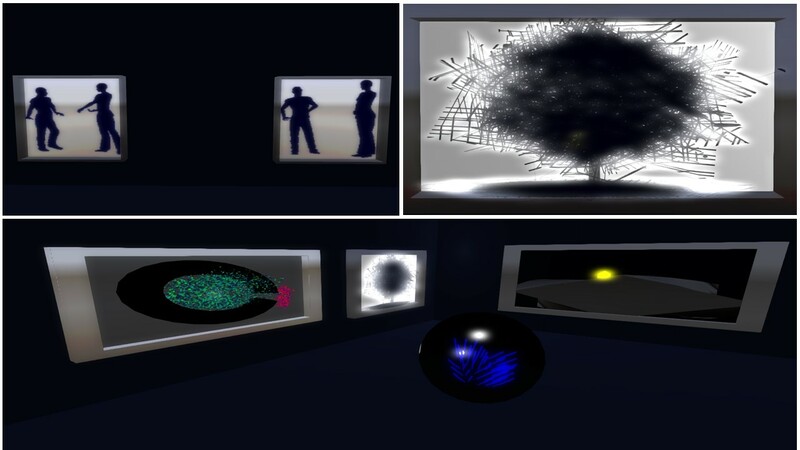 With her gallery she supports the artists and contributes to keep art in Second Life alive. I went to see the exhibtion at the opening day, November 29th, but had to return home just after a first short view, hence I revisited a few days later. The upside was that I had the exhibition mostly all for myself. Adjacent to Calypso’s pictures you can see the work of MathieuL Bravin. His pictures have not a single theme. Most of them are in black and white. They are intended to transmit emotion and should not be simple pictures. Mathieu says that when he closes his eyes after looking at them he can hear the music, the tones of the actors, he can dive into the scene. The last exhibtion is opposed to Calypso’s and MathieuL’s exhibtion on the ground level of La Maison d’Aneli. 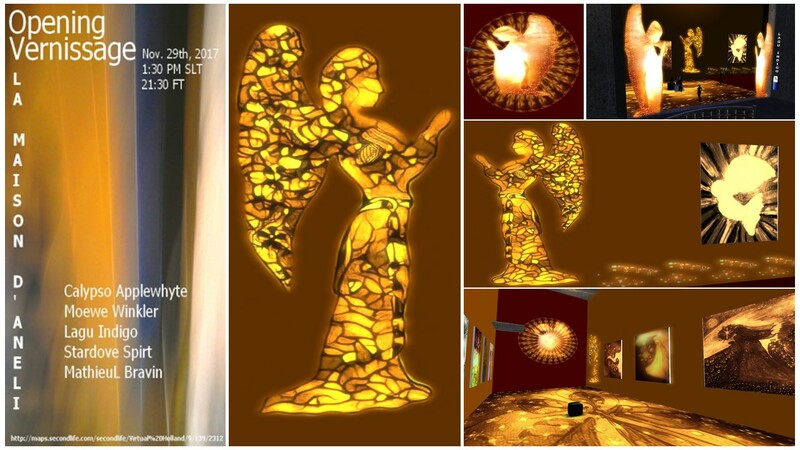 Moewe Winkler is painting and photographing in RL as well as in Second Life. In this virtual world she enhances her pictures by the means of 3D, scripting and sound-installations. Her art impresses by minimalism on one side and by colour and particles on the other side. I want to mention the shadow couple, which moves behind the screen. I also liked the the tree with it’s 3D effects a lot. During my visit I had a private chat with slave kelly and she asked me to let her join. I picked her up at home and she accompanied me visiting the last 3 exhibitions. We were all alone, nontheless it had something like “fetish meets art”. Thank you Aneli abeyante for providing your gallery La Maison d’Aneli for the art. I enjoyed my visit.